There is little doubt that the late cartoonist John Callahan (1951-2010) was as politically incorrect as they come. However, to paraphrase Jim Morrison, he had enough of a good life, or at least enough of an interesting one to base a movie on. 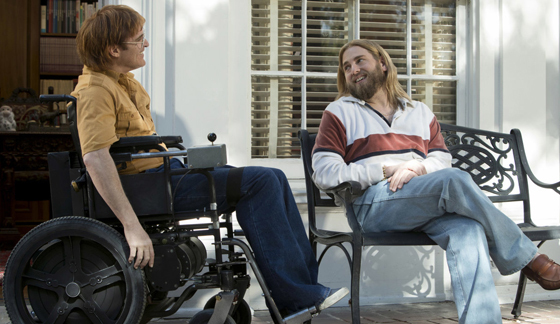 After several years in limbo, Callahan’s biopic “Don’t Worry, He Won’t Get Far on Foot” has finally hit the silver screen. Directed by Gus Van Sant (“Milk,” “Drugstore Cowboy”), this emotionally charged drama is one of the best films of 2018 thus far. This is due in large part to epic performances by three-time Oscar nominee Joaquin Phoenix (“The Master,” “Walk the Line,” and “Gladiator”) as the lead and Jonah Hill (“The Wolf of Wall Street,” “Moneyball”) in a supporting role. Based upon Callahan’s memoir “Will the Real John Callahan Please Stand Up?”, “Don’t Worry” is not a step-by-step biopic flick as it subtly dances back and forth among time frames during his life. An extra curve ball is thrown into the mix when some of his more notable drawings interject themselves across the screen to punctuate what his critics labeled as off-color humor. What we do learn about Callahan is that he was abandoned at a Catholic orphanage soon after birth and grew up in an area of Oregon called The Dalles near Portland. An alcoholic starting at the age of 12, Callahan became a quadriplegic at age 21 when on one evening in 1972 the equally inebriated driver (played by Jack Black) of his Volkswagen crashed into a utility pole at 90 miles per hour. After months of rehabilitation, Callahan is eventually released back into the wild, but he continues to drink, something that is not played as darkly as it could have been. A day eventually comes when he hits rock bottom and he joins an Alcoholics Anonymous group sponsored by the guru-like son of rich parents, Donne Green (Hill). Green speaks continually of being honest and of recognizing a higher power to Callahan as he slowly makes his way through a 12-step program. Through it all he develops a relationship with a pixie-like flight attendant (Rooney Mara) from Sweden whom he first meets shortly after his spinal surgery. It’s an unlikely relationship and one that seems out of place within the film. It impedes the overall pacing of the story as it also eliminates other aspects of the real Callahan’s life that could have been examined – his earning a degree at Portland State University, his troubled childhood, or the six-year bender he went on after his accident, for example. Don’t worry, this film is not all gut-wrenching sadness and pain as there is joy to be found in watching Callahan discover his true gift in life, a gift that led him to becoming a successful newspaper cartoonist despite his physical limitations. Phoenix delivers a raw, emotional performance as dives into his character with abandon. It ranks as one of his best roles and deserves to be remembered when Oscar season comes around. The same can be said for Hill who shines in a career defining role as an AA sponsor with his own set of demons. 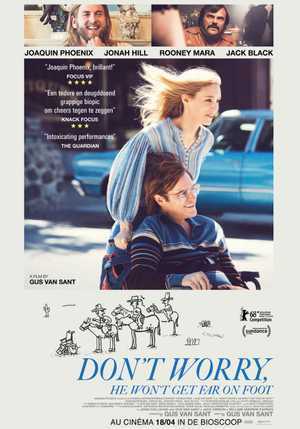 It is a genuine pleasure to watch them both as “Don’t Worry” won’t leave you any time soon after you leave the theater.